”It is with great pleasure that we announce we are playing the States again. After a wait of five years we are finally back. It’s a huge privilege to be playing with ’The Psychedelic Furs‘. A band that James have loved and respected since our formation. 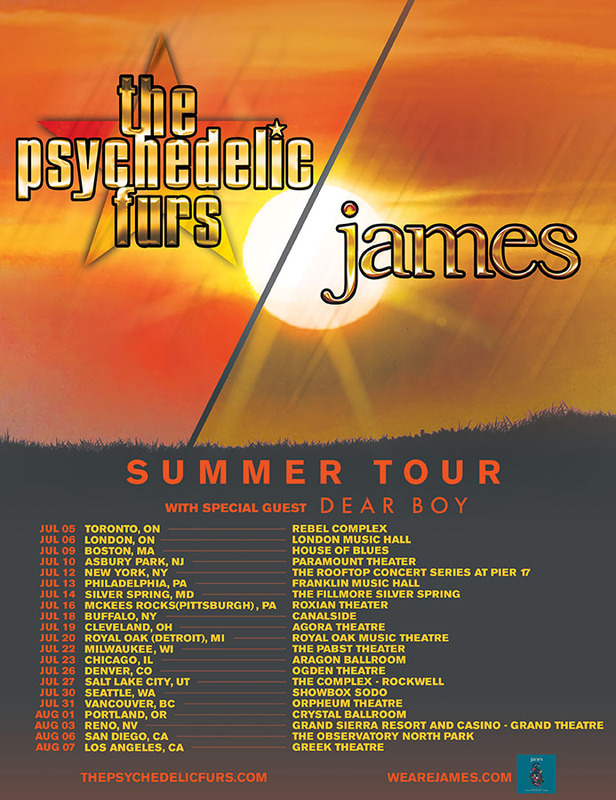 Aye the band are returning to the U.S. and Canada for a co-headline tour with The Psychedelic Furs this summer. Tickets on sale this Friday at 10am local time, links on the wearejames.com live page. We’ll also have VIP Soundchecks at nine of these shows (sorry it couldn’t be more! ): Toronto, Boston, Silver Spring MD, Chicago, Denver, Seattle, Vancouver, Reno, LA. These will only be available from the TM Stores web shop here on our site, for this tour it’s via an upgrade which requires purchase (elsewhere) of a standard concert ticket too. Take care to avoid confusion when buying your tickets, as some venues and outlets offer ‘VIP’ options of their own, which we’re not involved with and don’t include entry to the soundcheck. UPDATE: New date added – Stern Grove in San Francisco on Sunday 4th August. This is part of the Stern Grove Free Concert Series (free entry on first come, first served basis) held on Sunday afternoons in the open air in a beautiful setting. This is another James/Furs co-headline. The Living In Extraordinary Times Tour is now underway! And we’re off! 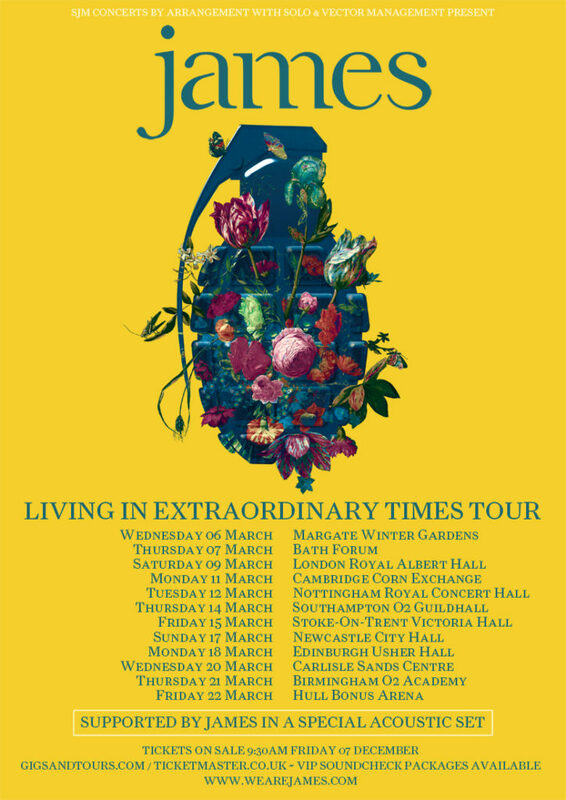 The much anticipated Living In Extraordinary Times Tour kicks off tonight in Margate. Over half the dates are already sold out so be quick if you’d like to join us—you’ll find links and phone numbers for official ticket outlets on our live page. If you’ve got your heart set on one of the sold out dates, check out the authorised fan-to-fan resale sites (capped at face value + fees) we have listed, and keep an eye on the hashtag #ExtraordinaryTix on twitter. Also worth asking the venue if there’s a waiting list you can join. Be sure you come down nice and early to catch the very special acoustic set prior to the main electric set. You’ll want to be inside the venue by 8pm at the latest. You snooze, you lose! Don’t forget to take a peek at the merch stand for an array of Fair Wear certified t-shirts (some are organic cotton as well) plus by popular demand our brand new James scarves! As well as an assortment of other goodies. At long last the band is returning to Greece. We’ve two exciting shows lined up this summer: our own gig in Thessaloniki at open air Fix Factory on Friday 7th June, followed by Release Athens Festival with the incredible Iggy Pop on Saturday 8th June. “It’s a huge honour to be sharing the same stage as the legendary Iggy Pop,” says Jim. “Massively influential and an inspiration to not just us, but generations of artists. Pre–sale for Thessaloniki including—our VIP Soundcheck tickets—starts on 30th January at 11am local time (EET). Tickets for Athens are on sale now. For ticket links visit the wearejames.com live page. Pleased to confirm James will play Doncaster Racecourse this summer on Saturday 17th August. The gig starts after the races finish for the day and tickets include entry to both. We’ve arranged a fan pre-sale for 10am this Wednesday (23rd Jan), you’ll find the link on our live page when the sale opens. Note there are discounted tickets for Under-18s attending with an adult if you fancy a family outing! Tickets for the day’s races plus gig are priced at £35 for adults and £20 for Under-18s (they must be accompanied by an adult). The band will play shortly after the races finish so this’ll be an early one. Check the racecourse’s page for a rough idea of times. The shopkeepers are kicking off the new year with a sale on a selected formats of Living In Extraordinary Times, plus some super deals across the Girl At The End Of The World stock (e.g. CD + art print was £12: now £5; heavyweight double vinyl with print down to £12 from £20!) and the Better Than That EP on 10″ vinyl (was £14 now £9). If you’ve xmas spends burning a hole in your pocket, have a gander. “Hi everyone, welcome to the next James tour. March 2019. This is officially the ‘Living In Extraordinary Times’ tour. So expect plenty of the last album. But also something a little different. We will be supporting ourselves acoustically. So your evening starts low key and informal. A short interval and then a full on bells and whistles electric set. We’re having a fan pre-sale—including VIP Soundcheck packages—this Thursday 6th December at 9:30am. To take part in this you need to register via the web shop landing page here. You’ll then receive an email with the pre-sale link and code from the shop. You can also get a code immediately by purchasing something from the lovely new tour range unveiled tonight! During the pre-sale there will be a 4 ticket per person limit. Tour dates with age limits for each venue as advised by the promoter are below. We love to see the next generation of James fans introduced to live music – bear in mind age limits are at the discretion of the venue so we always advise you to double check with them direct if you’re bringing children. Update: The tour has been extended to Portugal, with dates at Coliseu do Porto on Wednesday 3 April and Lisbon’s Coliseu dos Recreios on Thursday 4th April. Tickets are on sale now, links on the live page. Some super Black Friday bargains in the web shop today… Save yourself a packet on most formats of Living In Extraordinary Times (white/yellow gatefold with signed print! deluxe CD! trusty cassette! ), the Better Than That vinyl, and even bigger discounts on good old ‘Girl’ if you’ve catching up to do. Get some Xmas shopping out of the way while the going’s good. Due to unprecedented demand, Thursday’s show at The Irish Village has been moved to the Dubai Duty Free Tennis Stadium. Original tickets remain valid. Please note the venue has stated that you’ll need to have your ticket scanned and collect a wristband at the main entrance to The Irish Village, before you proceed to the Tennis Stadium entrances. They’ll be issuing wristbands from 6pm.